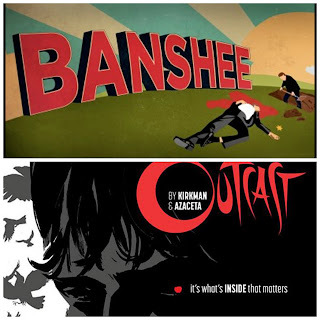 Something to Muse About: CINEMAX series Banshee and Outcast to be featured at New York Comic Con next month! CINEMAX series Banshee and Outcast to be featured at New York Comic Con next month! For the first time, the CINEMAX drama series BANSHEE and OUTCAST will have panels at New York Comic Con, being held at the Javits Center this October. Debuting in 2013 and achieving record ratings for CINEMAX, BANSHEE follows Lucas Hood (Antony Starr), an ex-con and master thief who assumes the identity of the sheriff of Banshee, Pa., where he continues his criminal pursuits while enforcing his own code of justice. The series returns for its fourth and final season in Jan. 2016. OUTCAST, based on the Skybound/Image comic title by Robert Kirkman, creator of “The Walking Dead,” and artist Paul Azaceta, follows Kyle Barnes (Patrick Fugit), a young man who has been plagued by demonic possession all his life. Now, with the help of the Reverend Anderson (Philip Glenister), a preacher with demons of his own, Kyle embarks on a journey to find answers and regain the normal life he lost. But what Kyle discovers could change his fate — and the fate of the world — forever. OUTCAST debuts in the USA on CINEMAX and internationally on FOX in 2016, and is produced by FOX International Studios. Below is panel information on the two series. Follow @Cinemax and @OutcastCinemax on Twitter along with the hashtags #Banshee and #Outcast for live event coverage of the BANSHEE and OUTCAST panels. The BANSHEE panel in Room 1A06 at 7:00 p.m. will be moderated by Grantland’s Andy Greenwald. The panel willinclude executive producer and co-creator Jonathan Tropper and cast members Antony Starr (Lucas Hood), Ivana Milicevic (Carrie Hopewell), Eliza Dushku (Veronica Dawson), Frankie Faison (Sugar Bates) and Matt Servitto (Brock Lotus) in conversation about the series’ fourth and final season. The OUTCAST panel in Room 1A06 at 1:30 p.m. will be moderated by Jon Glaser (HBO’s “Girls”). The panel willinclude creator and executive producer Robert Kirkman, executive producer and showrunner Chris Black and lead actor Patrick Fugit (Kyle Barnes).